Assembled by each couple, these baskets full of their favorite things are truly one-of-a-kind. 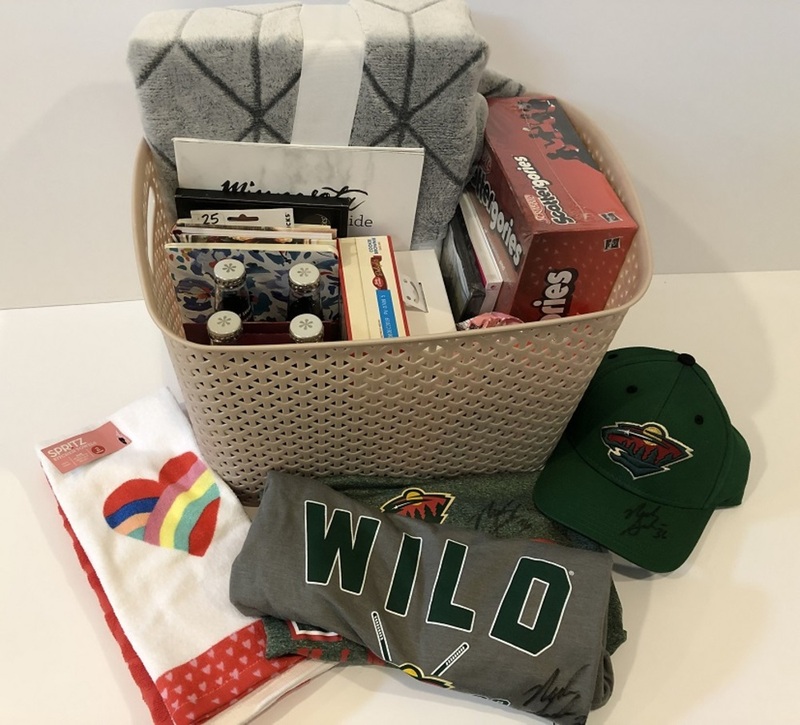 Nick & Maddie's basket includes: a Pink Heydey wireless speaker, an autographed Wild hat, two (2) bags of Hershey Kisses, an autographed green Wild long-sleeved shirt (size medium), Valentine's Day kitchen towels, Betty Crocker cookie brownie bars mix, BH cosmetics newutral 28 color eyeshadow palette, an autograhped grey Wild t-shirt (size medium), a copy of the 2018 Edition of Minnesota Food Guide, a copy of "On Becoming Fearless..In Love, Work and Life" by Arianna Huffington, a $25 Starbucks gift card, Flowarl journal, "52 Lists for Happiness" by Moorea Seal, Scattergories board game, "Home" DVD, "Hidden Figures" DVD, a grey fuzzy blanket, and a Blackberry flavor Izze Sparkling Juice. Proceeds benefit Women's Advocates, a local domestic abuse shelter.